Simon Whitlock sits in eighth position in the current Premier League table, but he could possibly move into seventh place at the end of play, depending on Peter Wright’s result later in the evening. The Wizard lost 7-4 to Peter Wright last week in Birmingham and has won only two of his last 12 Premier League matches. Last weekend at the European Darts Grand Prix, he reached the quarter-finals before losing to James Wade. On his way to the last eight he averaged around 99 in defeating both Jan Dekker and Mensur Suljovic. Rob Cross is currently third in the table and has qualified for the play-offs in his debut Premier League season. If Michael Smith loses in the first game of the evening, Cross would be able to take second place with a victory in this match. Voltage lost 7-2 to Michael van Gerwen last time out and he is without a win during his last four Premier League matches – that’s his longest run without a win in this season’s Premier League. Cross was defeated 7-1 by Simon Whitlock on night two of the 2018 Premier League, with his 87.74 match average during that defeat his lowest of the campaign so far. When these two players met on night two of the 2018 Premier League, Whitlock punished a very poor performance by Cross and won 7-1. They both had a large change of fortune following that match, with Cross going on to win eight of his next nine matches to establish his position in the play-off places whilst Whitlock won only two of his next 11 matches and as a result slipped down the league table. 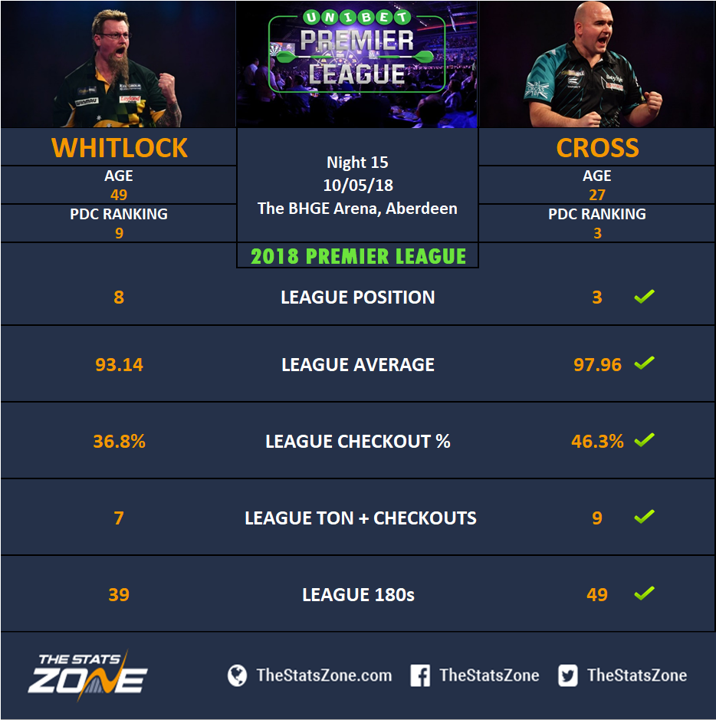 Although Cross has not been playing at his peak over the last few weeks, he has still been generally producing a higher level of performance than Whitlock and Voltage looks capable of taking the two points in this encounter.